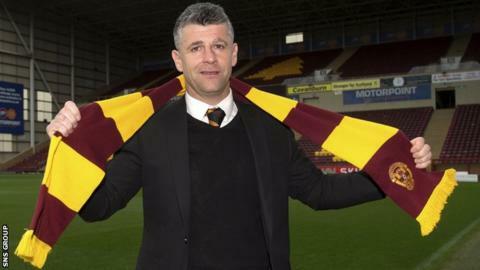 Stephen Robinson says former Motherwell boss Mark McGhee gave him his backing to become the permanent manager at Fir Park. McGhee was sacked a fortnight ago, with Robinson taking temporary charge. "I spoke to Mark in depth on Tuesday morning when he offered me his advice and best wishes hoping I got the job," Robinson explained. "So it's with Mark's blessing we do this and I'll give it my best shot to turn the football club around again." Robinson, 42, was sacked as Oldham manager in January and rejoined McGhee's coaching team in February, having previously been assistant to the former manager and his predecessor Ian Baraclough. "I'm delighted and honoured to be working for this club," he said. "It's got a great history and tradition and as I've said numerous times there are a lot of good people around the football club that we owe performances to." Robinson, who has signed a contract until May 2018, says having been interim boss following McGhee's departure will work in his favour. "It gives me a head start," he added. "I know the vast majority of the players really well and I now what's needed. "Both previous managers let me take a lot of the training - I'm used to that I don't think loads will change from what I've done in the last two weeks. We tried to put at structure in place where we're hard to beat and stop conceding goals and we'll continue to do that to stay in this division. "The be all and end all is to keep the club in the Premiership, we'll worry about things after that and we'll make plans for going forward after that because at this time we can't sign any other players, we have to deal with what we've got. "We've got to deal with the injury situation which we have and rectify that and make sure we get through to the end of the season." Robinson confirmed James McFadden will remain in position as assistant manager. "James is contracted to the end of the season and we'll work together until then," he said. "I'm conscious there's an identity at the football club. There are a lot of boys that have been here a long time so we need to retain that as well."